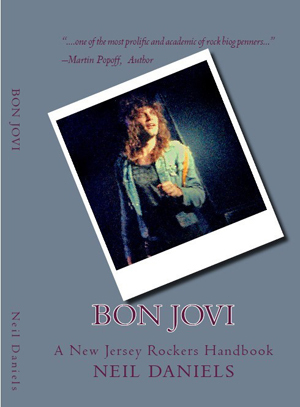 Bon Jovi - A New Jersey Rockers Handbook is a collection of writings on BON JOVI from author Neil Daniels. It is filled cover to cover with details on the people BON JOVI have collaborated with over the years as well as facts about the music, tours and concerts from the American rock band’s lengthy history. Daniels compiles reviews, articles, interviews and much more. Not only that, but there are contributions from some revered rock scribes, songwriters, producers and even fashion designers just to spice things up. BON JOVI are undoubtedly one of the most successful bands in the business and their staggering success speaks for itself. Bon Jovi – A New Jersey Rockers Handbook is essential reading for BON JOVI fans.